Published by: True Potential Publishing, Inc. Available via Glory to Glory Publications in the UK. Please contact CPI using the email link if you would like your name to go on a waiting list for this product. The USA publisher is presently considering various reprint options. A fresh translation of the entire Scriptures that consciously seeks to reveal the power and meaning of Hebrew and Greek words that can be watered-down in some of the other English translations. The goal of the ONMB is to bring greater understanding of and appreciation for the power and authority given to Believers - a power in which we are all expected to walk. The ONMB also helps to bring to life the Jewish root of the Scriptures - many words previously translated according to tradition are changed to the literal. Hebrew is a very expressive language, so the ONMB brings out much of the power and sheer majesty that has commonly been omitted. Ephesians 2:14 is the key text for this translation, exploring what it means for Jew and non-Jew to be united in Christ. This is a general translation in modern English, so it is considered to be an entry-level Bible, albeit in some places the wording can be a little difficult compared to the "smoother" standard English translations. God's word can sometimes be uncomfortable! Whilst via the Holy Spirit this should be a suitable entry-level Bible, backed as it is by a considerable body of footnotes and an extensive glossary, this really should be a "must-read" for the serious Bible student. It is an excellent comparator to the standard English versions. The Glossary is second to none! Rev. William J. Morford graduated from Hobart College in 1953 and was a member of the 1955 class of the University of Minnesota's graduate school in hospital administration. He was ordained in August 1988 by Christian International of Santa Rosa Beach, Florida, served on staff as student advisor for Christian International School of Theology and is a Certified Instructor to teach Christian International's series on the prophetic gifts. From 1993 through 1999, Reverend Morford studied Hebrew under Rabbi Eliezer Ben-Yehuda, grandson of the Eliezer Ben-Yehuda whose lifetime work made Modern Hebrew the national language of Israel. Reverend Morford and his wife, Gwen have travelled to Israel several times. He has written three books: "The Power New Testament", "God's Rhythm of Life", and "This God We Serve". 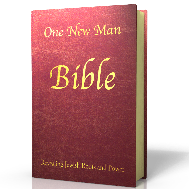 There is a One New Man Bible review by Peter Sammons (PDF). Another review of One New Man Bible on Prophecy Today. There is now some free material associated with this book that you can download. It is in the form of a Microsoft PowerPoint presentation with voice over. Download Microsoft Powerpoint slide deck with voice over.